Mukhallat Malaki, which means rich perfume essences for the nobility, is a blend of traditiional arabic perfume oils, evocative of timeless tradition. Malaki has a long lasting and lingering fragrance. 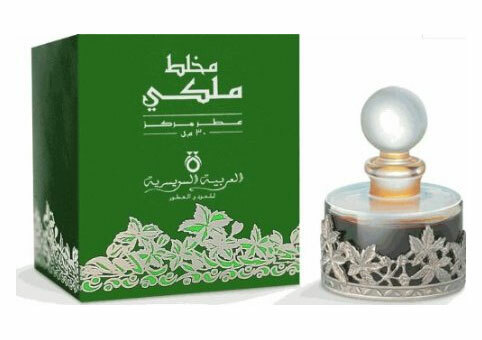 The word Maliki means 'The Royal Blend'. A rich oriental agarwood based floral blend with a top note of pure Turkish rose and a body of Indian & Cambodian agarwood. Hint of flowers, expensive Indian amber, Spanish saffron and a base of woods, moss and musks. Made for Men. Concentrated Perfume Oils (CPO) is the most expensive version of any fragrance (others are EDT, EDP or Cologne) for the amount purchased; CPO's have the highest concentration of aromatic essences such as essential oils, sometimes up to 40% of the total ingredient, this makes it the most captivating from all the other types due to the whole symphony of top, heart and base notes released over a certain amount of time depending on the perfume. The perfume oil is applied directly to the skin on pulse spots – behind the ears, insides of the wrists, at the throat; be careful in applying directly on skin if you have sensitive skin or suffer from allergies, if this is the case you should test a small drop first or only apply on clothing. Due to the concentration of aromatic essences, it is the longest lasting from all the other fragrances, even though a tiny amount is required for hours of bliss, this is reflected in the small sizes that is being sold such as 3ml or 12ml.